The market has clearly entered a consolidation phase. We did get several down days, but buyers emerged quickly and bid prices back up, which has resulted in a sideways move. With another week of lunar Red period to go we should remain cautious, but also start looking ahead to the upcoming lunar Green period. Technically the S&P 500 has broken out to the upside and is now digesting the gains. The old overhead resistance line has now become support (currently around 1540), and this support has to hold if this is a real breakout. If the S&P falls back below 1540 then it would confirm a false breakout and probably result in a serious move to the downside. So, the coming weeks are going to be crucial. 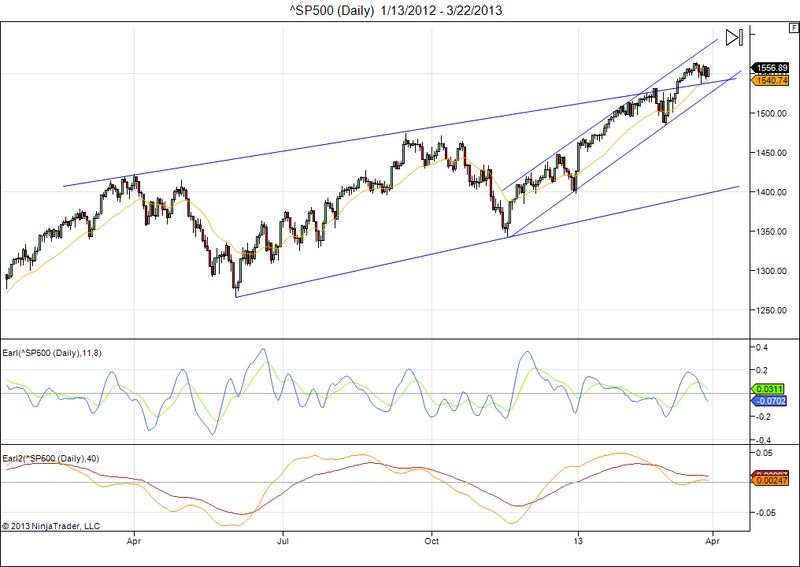 If the S&P holds above 1540 this week, then we are likely to see another push higher in the first half of April. If the 1540 level doesn’t hold, then the March 15 highs are likely to stand for a while. I would stand aside until we get more clarity, or at least keep very tight stops if you chose to remain in the market. Once in a while I get questions why my lunar Green period starts 3 days after Full Moon, rather than on the Full Moon day itself. So let’s take a look into that question. Yes, you will be able to find charts in which Full Moons coincide nicely with bottoms, with New Moons marking tops. But historically that has not been the optimal use of the lunar phases. In my research I looked at almost 60 years of history (using the S&P 500). #3) Buy our Lunar Green period, which starts 3 days after Full Moon, and hold for two weeks until Red period starts. The S&P recorded an average annualized gain of 7% over this period, so we can see that all three strategies offer an edge. But the lunar Green period is clearly superior, registering 4% above average return, where buying Full Moon or 3rd Quarter Moon has given only a 2% edge. The question becomes: why this 3 days offset? For a long time I thought this was probably a kind of delayed effect, just like the Sun culminates at noon but temperatures typically peak several hours later. Or just like the ocean tides, which peak several hours after the tidal forces have peaked in the given location. But recently I found another possible explanation on the NASA website. It turns out that our Moon passes through the Earth’s magnetotail in the six days around Full Moon, and emerges from it about 3 days after Full Moon, exactly at the end of the lunar Red period we found for the stock market. 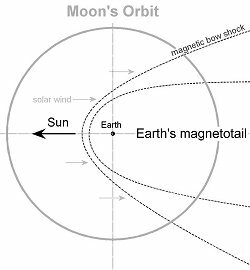 When the Moon is inside the magnetotail it gets negatively charged and influences the magnetic field. This changes again when the Moon goes through the “bow shock”, three days after Full Moon. So this could explain the 3 days delayed effect we find in the markets. This entry was posted on March 25, 2013 at 10:04 am	and is filed under Financial Astrology, Market Commentary. Tagged: Full Moon, Green Period, Lunar phase, New moon, Red Period. You can follow any responses to this entry through the RSS 2.0 feed. You can leave a response, or trackback from your own site. Great info you have going on the blog. 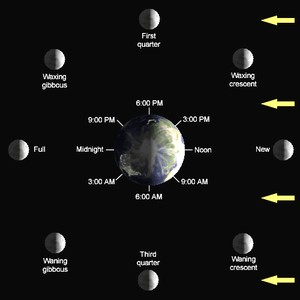 Do you know an excel formula for determining moon phases? It is also possible to call SwissEph functions directly from inside excel. You’ve come such a long way since the old Yahoo Group days where we first bumped into each other. Kudos!. Such impressive work. Glad you like it, HVA. The researching part has always come easier to me than the writing up of the things I have found. But I am trying to improve. Investing purely in the Red periods, $100 in 1950 would have turned into $259 by the end of 2008, which is only about 3% annualized. Clearly, waiting 58 years to double your money in the stock market is not a great strategy. But Red periods do still produce a small profit in the long term, so you cannot make money by going short in every Red period. One can only make money by going short in Red periods when the market is in a longer term downtrend, and sometimes when the market is in sideways mode (like it was in 2011). Because the market is often flat (or only small gains) during Red periods, it is a good strategy to stay invested in stocks and just write covered call options on your stocks during the Red periods, buying them back when Green period starts. This provides extra income, without having to sell your stocks every two weeks. I will discuss that in a future post on the blog.